The Liverpool midfielder Steven Gerrard has said that he is very much interested in taking his coaching badges once he retires from international football. The 32-year-old England midfielder recently made his 100th appearance for the national team in the friendly match against Sweden. England lost the match 4-2 after four spectacular goals from the PSG striker Zlatan Ibrahimovic. Still, it was a momentous occasion for the Liverpool midfielder, who also took time to reveal his future plans. He has said that will be making an effort into becoming a coach once he retires from playing football. In order to prepare himself for coaching career, he will start taking his coaching badges when he eventually retires from international duty. Gerrard will be undergoing the coaching badges during the international weeks. Right now, he is not only involved with Liverpool, but also the England national team. This means that he does not find enough time to take coaching badges. Even though he is interested in becoming a coach, Gerrard has revealed that he would only pursue a career in management only is he thinks he is good enough. He does not want to believe that being a decent player has made him a good football manager as well. “I’m going to go into my coaching badges after my England days are over and when I’ve got the time. When the international breaks are on, I’ll go and do my coaching badges and we’ll see where it goes. I’ve always said I’ll only become a coach or a manager if I’m good enough. I don’t think you go down that road because you’ve been a decent player. That’s a mistake that a lot of footballers have made,” said Steven Gerrard. The 32-year-old has been largely overshadowed at Liverpool by Luis Suarez this season. The captain of Liverpool, Steven Gerrard, has said that the Liverpool players need not to panic and should keep themselves calm and composed. Gerrard gave this statement while talking to the reporters after the match against Manchester United. Liverpool were defeated by United in that match by a close margin of 2-1, which was predicted by one of the liverpool fanzines. The Liverpool team was playing on its home ground, but, Brendan Rodgers’ boys disappointed the home fans. There was a huge excitement among the fans of both the clubs regarding this match. More than 44,000 people were in the Anfield Stadium to watch this high profile encounter. Manchester United continued its winning streak and won its fourth Premier League match in a row. On the other hand, Liverpool’s poor run continued as the team lost its third match in the ongoing Premier League. Liverpool is currently at the 18th position in the points table with only two points in five matches. But, Steven Gerrard believes that there is no need to panic too much as the team can still make a comeback in the competition. “If we get panicked too much, we would struggle in the upcoming matches as well. There are still quite a lot of matches to be played and the team is good enough to make a comeback”. Liverpool will now take on West Bromwich Albion on 26th of September at The Hawthorns. Liverpool midfielder Steven Gerrard has said that one of the main reasons for the disappointing season Liverpool had last season was the absence of Lucas Leiva. The Brazil international has grown into one of the important members of the squad due to his defensive abilities and also the ability to start an attack. Even though the 32-year-old Steven Gerrard missed large portions of the last season, he has said that the absence of Lucas Leiva was more crucial. Liverpool finished the season in eighth position, while it was the record lowest after many seasons. In the second half of the campaign– when Lucas Leiva was injured – Liverpool’s form would have placed them in the 17th position had it not been for the points accumulated in the first half of the season. The 25-year-old was initially criticised for his poor performances during the reign of Rafael Benitez. However, he has gone on to become one of the important members of the squad. After more than six months out of the first team, Lucas Leiva finally made his first appearance in the pre-season friendly match against Toronto FC. Steven Gerrard has expressed his confidence that the team will be able to do well this season with the Brazilian international back in the squad. “It [Lucas’ injury] was a big factor [on our season], because when he got the injury he was probably our best player, form-wise. He was playing superbly well, and he plays that position in the team where he does the ugly work, the work you don’t really like to do: breaking up the play, protecting the back four, and when we lose the ball and teams counter-attack, he stops a lot of goals. It’s great to have him back. 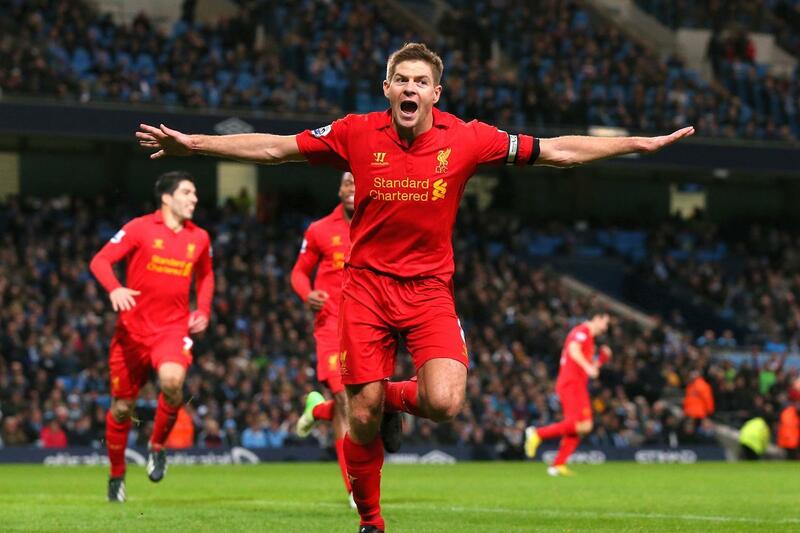 He’s a great person; he’s great for the squad,” said Steven Gerrard. England midfielder Steven Gerrard has said that he is extremely confident that the national team can overcome the disappointment they suffered at the Euro 2012 the form of penalty shootout defeat at the hands of Italy. Steven Gerrard was one of the bright aspects of the England team at the Euro 2012. However, at the age of 32, it is unlikely that Steven Gerrard will be able to play at the Euro 2016. This calls for the replacement of one of the high profile players within the team and it is certainly not going to be easy. Gerrard reckons that Roy Hodgson should resort to using a number of young players in the World Cup qualifiers that will begin shortly after the start of the new season. The technical deficiency of the England players came to the fore in the Euro 2012 after they were outclassed and outpaced by a number of opponents. Gerrard reckons that it is extremely vital that the English Football Association takes a hard look at the youth academy and the development of the youngsters in very much the same manner the Germans. After completely overhauling the youth academy almost a decade ago, Germany now compete for everything at the international level. Jack Wilshere is one of the few techniclly gifted players coming through. “The education of the young kids is vital. But I hope it doesn’t take 10 years. I hope we’re good enough to improve and bridge the gap with these big teams before that. Keeping the ball – especially at this level – is fundamental. It’s key if you want to beat the big teams in these tournaments. You work so hard without it your opponent ends up running you into the ground and creating chances. Football’s a mad game at times. If we had won the penalty shoot-out we would have been through to the last four,” said Gerrard. Former England captain Steven Gerrard has welcomed the appointment of former Liverpool manager Roy Hodgson as the new manager of England. The English national team were without a manager since the resignation of Fabio Capello a few months ago. The English FA have not been swift in appointing a new manager as a replacement, which has led to many speculations surrounding the team. However, the English FA have now acted in order to help the team in the preparations for the Euro 2012, which is only a few weeks away. As a result, they have appointed West Brom manager Roy Hodgson, who was out of contract in the summer. Tottenham manager Harry Redknapp and West Brom manager Roy Hodgson were the front-runners for the job. However, the English FA have decided to go for the latter option without having second thoughts because it meant that they need not pay a huge severance fee to the club. Due to the long contract Harry Redknapp has with Tottenham, it would have cost the English FA at least £ 10 million to secure his services. Roy Hodgson, meanwhile, did not cost a huge amount of money. Roy Hodgson had a disastrous spell with Liverpool a few seasons ago, but Liverpool captain Steven Gerrard has welcomed the appointment. “I’ve worked with Roy. He’s a good man and a good manager. It’s important he’s given a chance and I’m looking forward to working with him again,” Gerrard said after the appointment was confirmed by the English FA. Roy Hodgson has said that his immediate target will be to make it into the quarter-finals of the Euro 2012. Hodgson refused to comment on the future England captain given that John Terry has recently been sacked from the post. It was John Terry’s removal from the captaincy that led to the resignation of Fabio Capello. Steven Gerard has shown quite a bit of interest in the fact that Liverpool might be able to hold the cup after six long years of drought. The captain has been quite contented with the performance of all the team mates and has seen quite a bit of improvement for all the members down the years. Their deteriorating performance has been seen in the fact that they have not managed to gain a single cup since 2006 where they managed to win the FA cup championship. Now after a span of 6 years of hard work and effort, they finally reach a stage where they are confident of winning the League Cup and adding another silver ware to their already existing collections. This might be quite a boost for the entire team and winning the cup might give them some added confidence by which they might perform even better. Steven Gerard is just hopeful that there is nothing unfortunate that turns up at the end due to which they have to lose an important chance of winning the cup. Although they seem to be at a better position against their competitors for the finals, one can never be sure of anything unless it’s completely over and the result is known. A similar phase happened in the year 2001, when they managed to win the league cup that year and went on to win three more cups consecutively. There’s no denying the fact that an award or trophy acts as a catalyst and players feel the need to perform better as they get to see rewards for their effort in front of their eyes. Steven Gerard is making sure that no lose ends are present which might spoil the entire show of events and lead to their loss at such a close and final stage. Joe Cole says that Steven Gerrrard deserves to win the Premier League for his achievements in his Liverpool career. The former Chelsea player joined the Reds this summer on a free transfer after constant speculation linking him with moves to Arsenal and Tottenham. The 28-year-old, who scored his first goal for the Reds during a 4-1 win against Steaua Bucharest in the Europa League this week, believes that Gerrard excels in his role for Liverpool.